Today our middle son had his end of school party. They ate special snacks and sang special songs that they had prepared. We, as their parents, got to attend and watch our beautiful children participate with their amazing school staff. Nico is a typically developing peer-model in on of the special education Pre-K classes, and he has the best teacher and staff we could have ever hoped for. They truly have cared for and nurtured our children. As the party was winding down his teacher set up a slideshow of our children, showing pictures taken throughout the school year. Since the class is very small, only 8 children, our little guy was in many of the photos. Nico had asked to sit up front with his classmates and he watched the show intently. When it was over he came over to me with tears pouring down his face. He told me that those were all the fun days he had at school and he was going to miss his friends so much. He was the only child crying and his teacher mentioned to me that she feels he is the only student in the class that truly understands what this transition is truly about. I tried to comfort him, but he continued to cry. As he received his “diploma” he hugged his teacher and sat on her lap for the class picture. He only started to perk up when he received his “gift” from the staff, which was a bucket with some great summer-centric toys. Still, he asked to go home with my husband and I. One of the support staff pulled out his ABC book with some of his work throughout the school year and showed me one of his “self-portraits”. In it he has a stick figure with a smile on his face and a big heart on the chest. 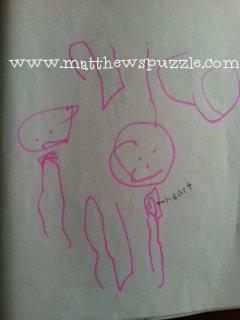 The staff member said that this picture says it all: Nico has a big heart. Nico is one of the sweetest children; always ready to share whatever he has. We are so fortunate to have been blessed with such a caring and loving child. He is truly one of the best peer-models, not only for his classmates but for his brother also. We learn from him how to be patient and persistent, and especially how to be loving. Congratulations on moving to Kindergarten, Nico! Mom and Dad are so proud.